If you’re a short person and you want a knee scooter for easy rental, consider the Junior Rover. This compact knee walker (or knee scooter as we call them) is awesome. It’s got all-terrain wheels and compact size. Take a look at the bright-colored Junior Rover for rent here in Denver at The Knee Scooter Store. LEARN MORE about the Junior Rover. CLICK HERE! At The Knee Scooter Store, we have the best selection of knee scooters in Colorado. 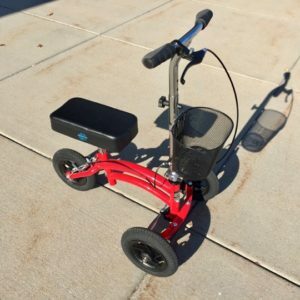 Whether you’re a short person, or tall, heavy or small, we can find the right knee scooter for you. Should I Buy at Walmart?